Each month, QSLA and your local library systems will work together to develop a themed booklist, reading tips, and family activities all designed for families with children ages birth to five. Click on the Read from the Start booklists below to download a PDF of the list. Build your child’s early literacy skills by creating rhymes with them! By creating opportunities for them to engage with the different rhyming sounds, you are building a foundation language skill. Research states that children’s responses to sounds in kindergarten are linked to their reading abilities in 4th grade (Psychology Today). As you go through your day, find ways to create rhymes about everyday tasks. They don’ have to make sense, the sillier the better. Ask your child to finish a rhyme you start, challenging them to listen to the sounds of the words. Here is our example: Now it’s time to go and play, I’m going to put all my toys on this tray! Monthly Family Reading Tip: Laugh! Use loud, quiet, and silly voices to make reading more engaging and fun for your children. Next time you and your little one are cuddled up to read, see how many times you can laugh, building their literacy skills and creating more sweet memories together. Monthly Booklist: To print out and share! Click on the images below to download our full booklists, or scroll to the bottom of the page to find every book at your local Los Angeles Public and LA County Library. Check it out…at your local library! Find this month’s books at your local library. Many of these books are also available for digital download. 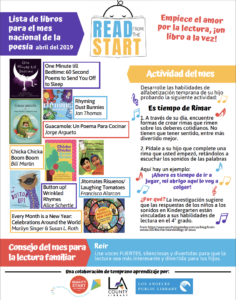 Browse Quality Start LA’s collection of booklists, child-friendly activities and holiday activities guides.